Drug Discovery is a resource intensive effort and high rates of attrition in late stage discovery is an unacceptable outcome. During the development process it is important to identify any potential liabilities associated with New Molecular Entities. Typically in the Lead-Optimization phase it is important to know if a new compound will produce animal or human toxicity at concentrations relevant to those expected to be therapeutic. IONTOX Scientists have more than 20 years of in vitro testing experience that can be focused on helping our clients understand potential liabilities of New Molecular Entities. A multiple endpoint concentration-response proﬁle of biochemical effects in relevant cell models can provide the mechanism-based data required to predict animal or human adverse events. When these response proﬁles are compared to estimated, or actual Cmax values it is possible to predict subcellular targets and likely in vivo responses. The IONTOX Multi-Endpoint Cytotoxicity Panel provides our clients with the conﬁdence they need when entering preclinical safety studies and human clinical trials. A single assay for cell health can provide important information concerning the relative toxicity of one compound versus another in the same group. This tells scientists how chemical changes in the development molecule impacts general cell health (FastTox™ ). The next tier of information provides insight into the subcellular mechanisms that are causing the adverse effect. story. After a 24 hr exposure, there was no cell death as determined by glutathione S-transferase leakage (GST). 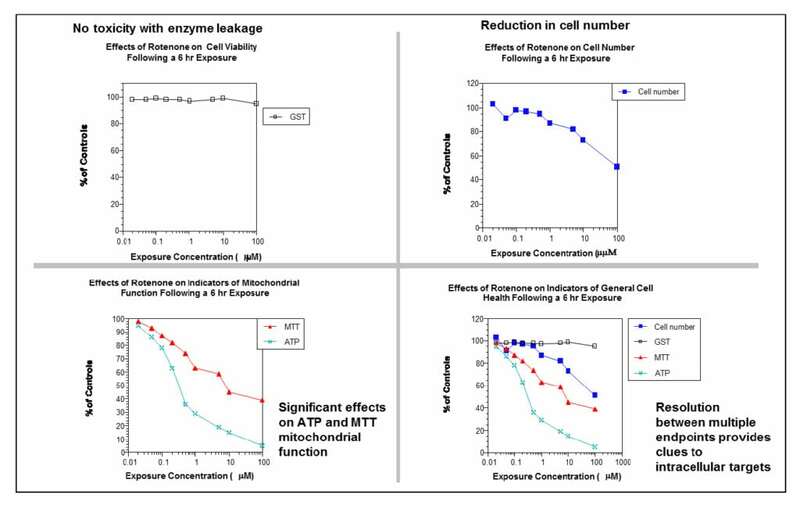 There was a reduction in cell number (upper right panel) and a pronounced reduction in both ATP and MTT (lower left panel). Taken together (lower right panel) these data demonstrate that the test molecule (rotenone) has its primary effect on mitochondria, causing a inhibition of complex II (MTT), and a reduction in cellular ATP levels. The loss of cellular energy resulted in a slowing of cell replication. Clearly, vastly different conclusions would have been made if only ATP or only membrane integrity had been monitored. By comparing the toxic concentration producing a half maximal effect (TC50) to the EC50 it is possible to develop an in vitro therapeutic index. The plasma concentration where toxicity would be expected to occur can also be estimated from these data.